At BAR we know what a stressful time the whole process of moving home can be. Whether you’re moving to meet the needs of an expanding family, looking for a smaller or more suitable home or moving for work, there are a great many things that need to be dealt with and decisions to be made; often quickly and when pre-occupied with a hundred other things. This is where we can help. BAR exists for one core purpose – to provide people moving home with a selection of thoroughly inspected, quality assured and reputable professional removal companies that will do their utmost to ensure that whatever else happens around your move, the removals process itself – from first contact through to you moving into your new home – is as pleasant a process as possible. 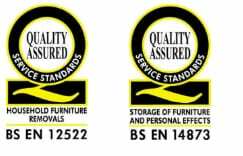 As well as joining BAR, many of our Members have elected to adopt the increasingly widely known European Standard for removals – BS EN 12522, and BS EN 14873 for Storage. In the unlikely event that something does go wrong or isn’t carried out to your satisfaction by one of our Members, we provide a course of action to resolve any problems or complaints you might have. You can find a BAR mover below or, if you have any queries about member services check out our Frequently Asked Questions below. The following are the most frequently asked questions we receive at BAR when people are looking to move home, wish to engage the services of one of our Members, or have encountered any problems with their move. If your query isn’t covered below please contact us at BAR on 01923 699 480. What makes a BAR Member different from any other removal company? All BAR Members have to meet set criteria to join, and not all movers can meet those standards. All our Members are audited annually and must adhere to our Membership Criteria and Code of Practice. If a company fails to maintain these standards then their membership terminated immediately and they can no longer promote their membership or use the badge. Is the BAR badge something movers simply pay to use? No, because otherwise it would be worthless as a sign of professionalism. The BAR badge means that you can rest assured that the Member will provide you with a quality service which adheres to all of our membership requirements. Members are proud to display the badge and rightly so, it’s not easy to become a Member nor to maintain the standards required to retain that status. How do I check if a mover is a BAR Member? You can check on this website, call us on 01923 699 480, or visit the mover’s website. The BAR logo should be displayed alongside the TSI (Trading Standards Institute) logo, as a real-time live link. Where do I stand if I need to cancel or postpone a move I’ve already paid for? As soon as you know there’s a potential issue contact the Member. If they can accommodate your new dates they will. If you cancel close to the date of the move you may need to pay part or whole of the agreed fee. It’s possible your mover has had to turn down other work to meet your original dates. Some of our members offer cancellation or postponement waivers – a small premium you pay to cover you should you need to change the date or cancel. What happens if any of my possessions are damaged or lost during the move? Even with the greatest care no mover can guarantee that belongings won’t get damaged in transit. All BAR members must have insurance that meets our standard and they will discuss the options with you prior to engagement. Do BAR provide removal and storage services? We don’t; but all of our UK Members and International Associates do. We’re their Trade Association and represent their interests and ensure that they meet the standards of membership. Will I pay more to use a BAR Member? What you pay is down to the individual Member, BAR don’t set prices. The question to ask is ‘will I receive value for money’ and by using a BAR Member company the answer is most certainly yes. The Criteria for Membership of the Association coupled with the Code of Practice mean that the service you receive is of the highest standard and you can be assured that all BAR Member companies operate legally, ethically and safely. Will I need to pay in advance for my move? Advance payment is normal practice in the removals industry; movers need to ensure that they have enough crew and vehicles to carry out your move on the allocated day. Should you cancel at short notice for instance, and they are unable to get a replacement booking, the company will have incurred a great deal of cost which the advance payment protects. What happens if the mover I’ve already paid goes out of business? Choosing a BAR member to carry out your move means you are protected by the BAR Advanced Payment Guarantee (APG). So if you have paid in advance and the Member ceases trading your move will be carried out at no extra cost by another Member. This also applies to Overseas moves. In the first instance discuss any issues arising with the Member company who provided the service. If the matter can’t be resolved to your satisfaction then you would have a right of access to our Alternative Dispute Resolution process, which is handled independently by The Furniture Ombudsman. Yes, all BAR Member companies are registered for VAT. How will my goods be protected during the move? All removal staff undergo regular, industry specific training, part of which is in the art of packing. The team will bring all the necessary equipment and materials to appropriately pack your belongings to make them as safe and secure as possible during the move or if going into storage. Different items need to be wrapped and packed differently and sometimes with specialist materials. Your mover will ensure each item is packed in the best way possible. Will the mover do the packing for me? Your mover can supply you with all the packing materials you need at reasonable cost or within the price of the move. It’s certainly worth asking your mover to quote for packing. Not only will they pack everything more securely they’ll be much quicker at the job too – after all it’s what they do! Do I need to clear out the attic for the movers? It’s essential that your mover knows what is in the attic in order to provide you with an accurate quote. On the day, the removal team will only go into an attic if is it boarded, safe and with suitable access and lighting; otherwise you will need to bring the items down. I can’t move in to my new home immediately, do your members offer storage? Yes your mover can arrange safe and secure temporary or longer-term storage for you. When agreed in advance your goods are usually packed straight into wooden crates on the vehicle and then warehoused, ready to be delivered to your new home. For larger items – such as cars – these may go into metal shipping containers. I have a piano/grandfather clock/barometer, is this a problem? All our Members are used to packing specialist items. There will be a specialist on the moving crew that knows how to safely dismantle, pack and reassemble barometers and clocks with pendulums, and the whole crew will be experienced in the safe movement of pianos of all sizes up to grand piano! Do I need to disconnect the cooker and un-plumb the washing machine? Yes, you should do this before the crew arrive. The mover isn’t allowed to tamper with mains services. What happens if I can’t get the keys for the new house on time? We’re aware that many moves are scheduled for completion on a Friday when it can be hard to get hold of solicitors, banks or agents. Your mover will be sympathetic to your situation and as flexible as possible, but of course it may well affect their day too. Ask your mover whether they charge overtime or extra hours or whether they offer a Late Keys waiver, where you pay a small premium to cover this eventuality. What happens if the new house I’m moving into isn’t empty? If the existing owner/tenant is still packing for instance, see the question about keys above. If they have vacated the property but they have left furniture or other belongings there, ask your mover if they will remove it for you – they may well do, for a small fee, or even for free! I have some valuable jewellery, will it be safe with the mover? If agreed beforehand the Member will appropriately pack delicate or fragile items, using special materials where appropriate. However, we would advise you to take responsibility for items such as jewellery. How long will it take to get everything loaded onto the vans? Your mover can discuss this with you once they’ve prepared the quotation. The estimators are exceptionally good at calculating the volumes for moves and the space they will take up on the vehicle(s). This combined with the number of crew, the access and any special items will determine the time needed to load up your belongings.